Since the 2016 U.S. presidential election, much attention has been focused on the role of bots in promoting political news on Twitter. But bots can play a role in spreading many other types of news and information as well. Indeed, a new Pew Research Center analysis finds that suspected bots are far more active in sharing links to news sites focusing on nonpolitical content than to sites with a political focus. And when they do share political news on Twitter, suspected bots are more likely to link to sites with ideologically centrist audiences than to ones with staunchly liberal or conservative followings. To conduct the analysis, researchers examined 108,552 tweeted links to 50 popular news websites sent during a six-week period in the summer of 2017. The sites all produce original content and include those associated with legacy news organizations (outlets that originated in print or broadcast) as well as digital-native sites (outlets that were “born on the web”). Researchers identified potential bot accounts by using a multistep process that is explained here. 1Suspected bots share a smaller proportion of links to popular news sites compared with other kinds of websites. Suspected bots shared 59% of tweeted links to the 50 news sites in the analysis. While that figure may sound high, it is lower than the average from a previous Pew Research Center analysis, which found that suspected bots shared 66% of tweeted links to a broader set of more than 2,000 popular websites, including sites focused on commercial products, sports and other subjects. The 50 sites in the news analysis include the digital versions of print newspapers such as The New York Times and The Washington Post, as well as sites for television and radio broadcasting organizations such as CNN, Fox News and NPR. 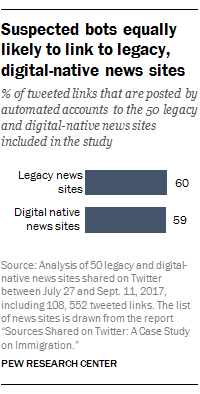 2 Suspected bots are no more likely to link to digital-native news sites than to legacy news organizations. One might expect sites that were “born on the web” to be more integrated with social media and online environments relative to legacy news sites, and thus more frequently trafficked by suspected bot accounts. Yet suspected automated accounts are prolific in sharing links not only to sites born on the web but also to legacy news organizations. Suspected bots shared 60% of tweeted links to legacy sites, about on par with the 59% of tweeted links to digital native sites. Automated accounts also weren’t especially likely to share links to three specific publications that were cited in an FBI probe of bot activity. The estimated share of automated links to these three publications – RT, Breitbart and Infowars – ranged from 44% to 58%. That was very close to the share for three prominent legacy news sites – The New York Times, The Washington Post and NBC News – which ranged from 45% to 57%. At the same time, the proportion of tweeted links associated with suspected bots varied substantially by media outlet. The share of links posted by suspected automated accounts to sites within Pew Research Center’s set of 50 news organizations ranged from 32% to 91%. More than half of these media outlets – 33 of 50 – saw a higher proportion of tweeted links from suspected automated accounts than from humans during the study period. 3 When suspected bot accounts link to news on Twitter, posts are more likely to focus on nonpolitical than political content. 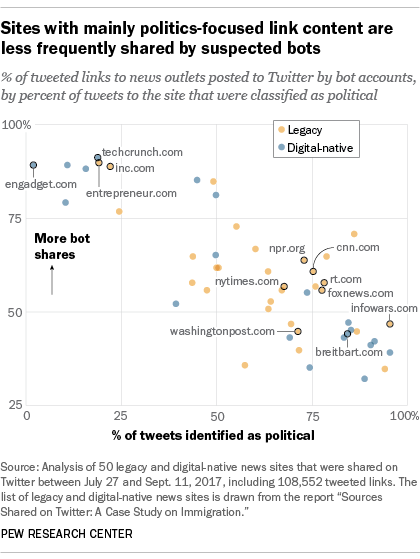 In addition to looking at the news sites that suspected bot accounts linked to, we examined the text of each tweet to determine whether or not it focused on political content. In general, the higher the share of politics-focused tweets that linked to a particular news site in our analysis, the lower the likelihood that a suspected bot shared the tweet. 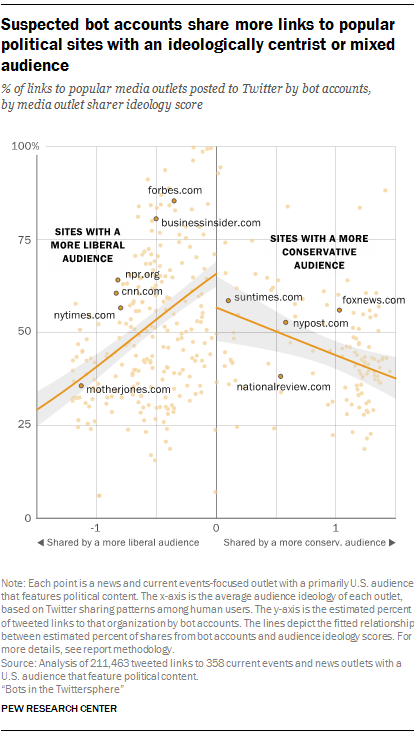 4 Suspected bots are more likely to link to political news sites that have an ideologically mixed or centrist audience than to sites that have a very liberal or very conservative audience. In an additional analysis of a broader set of 358 popular news and current-events sites that feature political content in their headlines, researchers found that the ideology of these sites’ audiences was negatively associated with the proportion of tweeted links shared by suspected bots. Automated accounts posted roughly 41% of links to political sites shared primarily by liberals and 44% of links to political sites shared primarily by conservatives – a difference that is not statistically significant. By contrast, suspected bots shared between 57% and 66% of links from news and current-events sites shared primarily by an ideologically mixed or centrist human audience. Note: For more on how we did this analysis, including how we determined which tweets were political, read the methodology section of our recent report on Twitter bots.